Eastern senior Ally Barber, middle, digs up a serve during Game 3 of Saturday’s Division IV district volleyball final against Portsmouth Clay at Jackson High School in Jackson, Ohio. JACKSON, Ohio — The journey proved much greater than getting to the final destination. 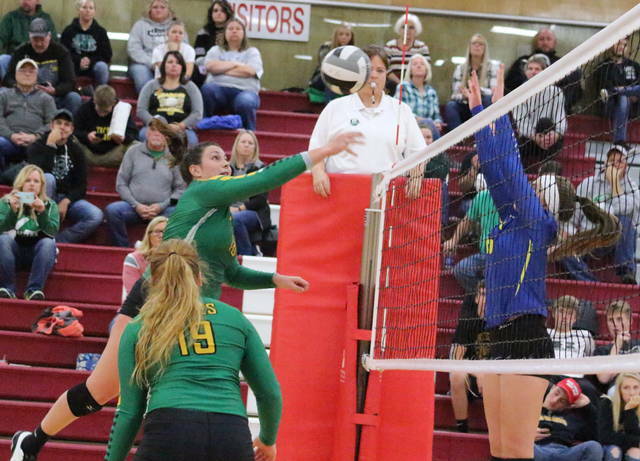 The Eastern volleyball team had its postseason run come to an end on Saturday following a 25-17, 25-20, 25-13 setback to top-seeded Portsmouth Clay in a Division IV district championship match at Jackson High School in the Apple City. The second-seeded Lady Eagles (19-6) led by at least two points in each of the three games played, but the Lady Panthers (22-3) never trailed beyond 16-15 in any set and eventually rolled to the straight-game triumph. There were 11 ties and eight lead changes throughout the match, with Clay holding double-digit leads in two of the three contests. Both teams led by as many as five points in Game 2 before PCHS rallied with a 10-4 run to turn a 16-15 deficit into a five-point victory. The Lady Panthers — who have now eliminated Eastern in each of the last three postseasons — led 24-13 in Game 1 and took their largest lead of the afternoon with the final margin in Game 3. Clay advances to Lancaster High School to face Fairfield Christian Academy in the second of two regional semifinals on Wednesday evening. 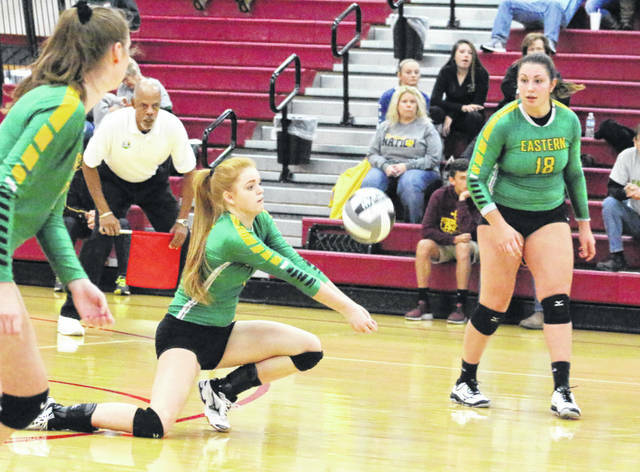 The Lady Eagles — who placed second in league play with a 14-2 mark — were the final Tri-Valley Conference Hocking Division left in the postseason. The Green and Gold were also the only team to knock off league champion Waterford this fall. 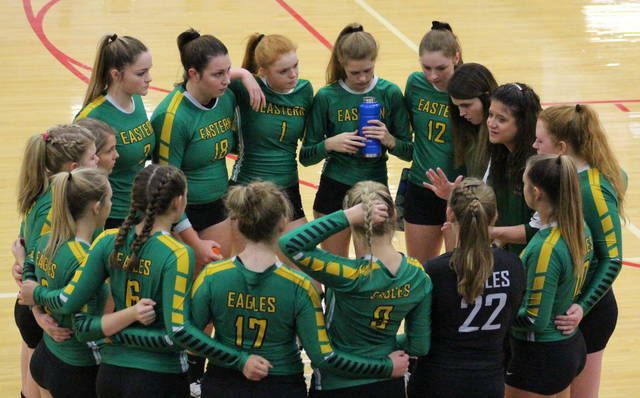 First-year EHS coach Mykala Sheppard has admitted to learning a lot about varsity volleyball this fall from a coaching aspect, but she also noted that most of what these girls accomplished is a testament to the upperclassmen — particularly with seven sophomores on the 14-person roster. Still, even though this season is now over, Sheppard believes that the program’s future looks bright. Eastern built a quick 3-0 lead in the opening game, but Clay rallied to tie things at five before taking a permanent lead at 8-5. The Lady Eagles closed back to within 9-8, but the hosts countered with a 13-4 surge that led to a 22-12 advantage. Both teams traded points out to 24-14, but the guests reeled off three quick points to close back to within 24-17. PCHS broke serve and wrapped up the eight-point win for a 1-0 match lead. The Green and Gold built a 12-7 lead in Game 2, but the Lady Panthers answered with a 9-4 run that tied the contest at 16-all. Clay followed with five consecutive points and led by at least two points the rest of the way, taking a 2-0 match lead with the five-point outcome. The Lady Eagles led 6-4 and 8-6 during Game 3, but Clay broke away from an eight-all tie by going on a 12-2 surge for a 20-10 advantage. EHS closed to within 21-13 before the Lady Panthers tacked on the final four points. 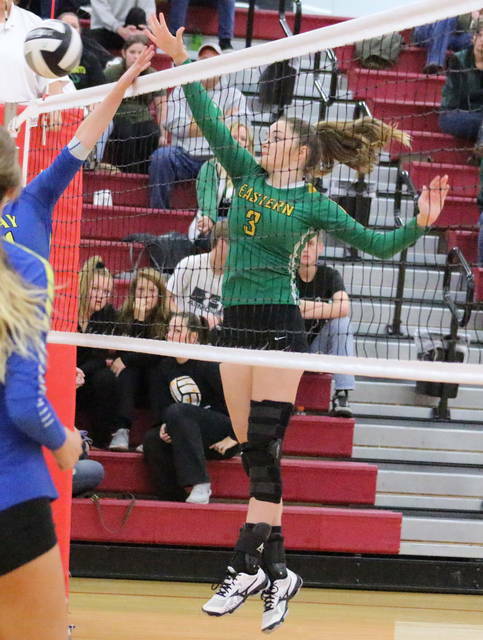 Eastern — which both last appeared and won a D-4 district final in 2015 — recorded 17 kills and 10 blocks in the setback. Caterina Miecchi led the net attack with 10 kills and Layna Catlett added three kills and a team-best four blocks. 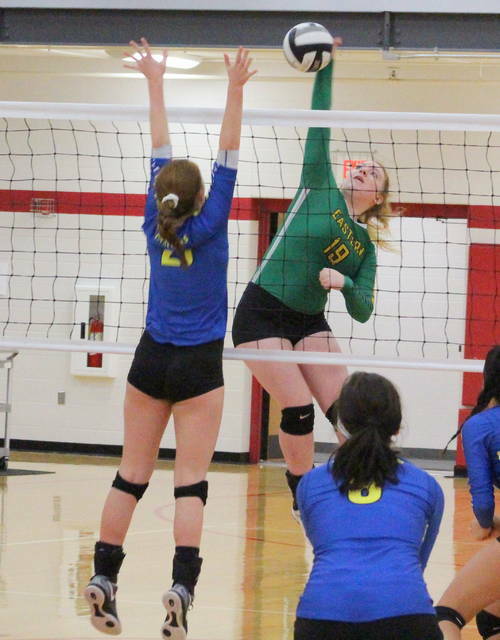 Kylie Gheen also came away with three blocks. Kelsey Casto led the service attack with nine points and four aces, followed by Miecchi and Alexus Metheney with six points apiece. Gheen and Jenna Chadwell also had two points and one point, respectively, in the setback. Ally Barber had nine digs to go along with two kills, while Chadwell also added two kills and two blocks. Casto came up with seven digs as well. Delanie Gilliland led PCHS with 13 service points, followed by Lila Brown with 11 points and Shaelyn Vassar with seven points. Jensen Warnock paced the Lady Panthers with 16 kills. Gilliand also recorded nine kills in the triumph. It was the final volleyball game for seniors Ally Barber, Alexus Metheney and Kelsey Casto in the Green and White, as it also was for Caterina Miecchi — who returns home to Italy after this school year.